I’ve always wanted to see a whale. I’ve never even been picky about what kind of whale. I’ve just wanted to see a whale. If I had a list of things I want to do before I die, see a whale would have been number 2 (after going up in a hot-air balloon — although seeing a whale in a hot-air balloon would be even better). When Linda and I planned to spend a day on the coast, the first thing I did was look on the Internet to find out my chances of seeing a whale. They weren’t good. Gray Whales migrate along the Oregon Coast and can often be seen from shore, but the season is supposed to be in March and April — although scattered individuals are sometimes seen later. Even during the peak season, there’s no guarantee that one will be spotted. But all day long, I took wistful looks out to sea. We were standing on the cliff above the ocean, looking south toward Three Arch Rocks. I was basking in the enjoyment of Steller’s Sea Lions and Western Grebe when suddenly, right where the grebe had been swimming, there was a whale. See that photo on the right? Look at it and imagine a 15-foot long gray mound with light gray splotches on it. I didn’t see the whole whale, just a rounded part of its back. I also saw the blow-hole with a little spray coming out and heard a whooshing sound. I screamed “There’s a whale.” Linda and Mary Alice looked where I pointed, but the moment was gone and so was the whale. But maybe a minute later, Linda yelled and pointed. It, or another one, had surfaced in almost the exact same place. We scrambled with our camera, but weren’t fast enough. At least all three of us had seen it. We were standing there reveling in our joy when a guy walked up. He struck up a conversation with us. Turns out he works in the human resources department of the lumbering company that owns most of the peninsula we were standing on. He said we were very lucky to see a whale that late in the year. 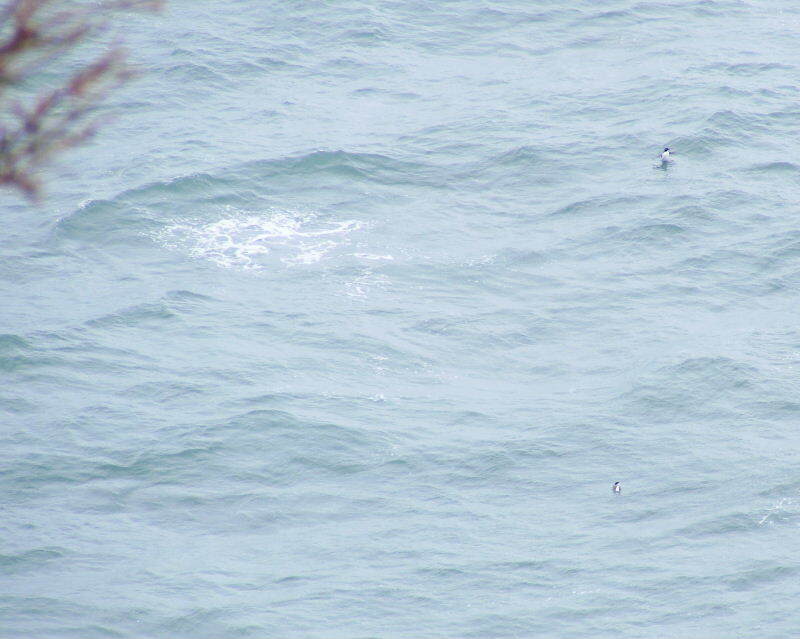 He chatted with us for about 15 minutes and was still around when Mary Alice spotted a couple spouts of spray far out off the point. We didn’t see the whales that were making them, but we saw the spouts. 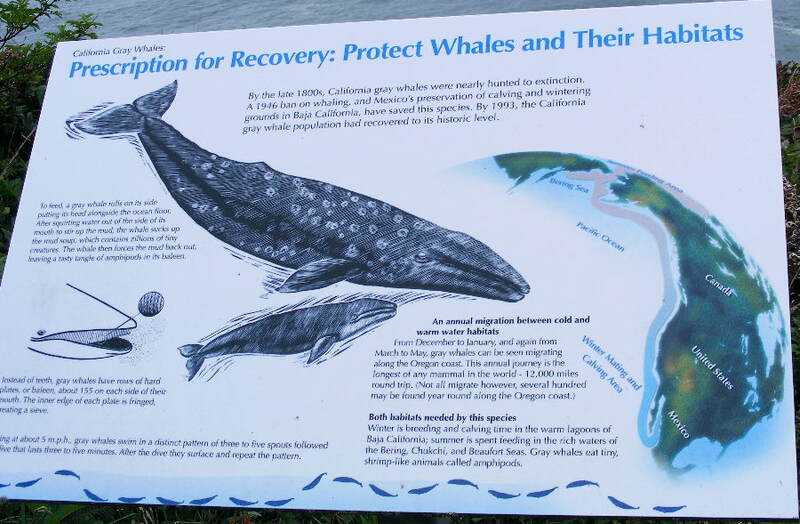 Because I didn’t get a photo of the whale itself, I took a picture of the sign that was posted by the lighthouse.